For a long time, I have looked at with disdain towards non-fiction. When it came to books talking about motivation or success, I used to bundle them in my head as completer balderdash. Thankfully, the epiphany happened and my brain opened up to receive this wisdom better. This led me to the popular book “The Success Principles” by Jack Canfield, originally published in 2004. In my view, it is a life and mindset altering book. I first stumbled upon Jack Canfield of the “Chicken Soup for the Soul” fame and his motivational tendencies when I was inspired to make my own list of 101 Goals. As usual, I searched Google for it and one of the things I landed upon was Jack’s own publicly tracked list of 101 Goals. As I got sucked deeper into that vortex, simultaneously, I landed upon his book in my library. The book, divided into 65 success principles, was a great read along with exercises and lessons to remember. Since the last lesson in the book is about empowering others as the book has empowered the reader, I thought I would here list down 11 of my favourite lessons with a short understanding of what he mentioned in the book. The easiest thing to do for anything not working in your favour is to look for a scape goat. How many times have we told ourselves, I am not getting a job because there is a recession conveniently forgetting that you haven’t even updated your resume. In most cases, the event is not our controllable and we end up blaming it. However, the reaction is what we can do about it. How we react to an event is most times going to have a big bearing on the outcome. Start taking 100% responsibility for your life today. When you look around, you can easily see so many people being indecisive with almost everything in life. The more decisions we have to make, the more the options, higher our confusion. However, as this success principle points out, it’s important to decide what you want. In fact, he shares an anecdote that even for something as trivial as the color of a notebook, it’s important to decide what you want. In this success principle, Jack Canfield goes on to tell us that we must decide what we want in life in all aspects – be it in our careers, relationships, spirituality or the physical body. The chapter ends with a great exercise helping us visualise the life we want. If you need some help and starting points on deciding what you want in life, Life Hack has some good tips. How many of us have stopped dreaming just because we would rather be real or rational than believing in possibility? There are a lot of books on this subject which tell us in no uncertain manner the role that our sub conscious plays in the actions and the results that happen to us in life. Believing in possibility then also entails giving the right inputs to the sub conscious which opens the right doors. To the uninitiated, it might sound like mumbo jumbo. But ask yourself that given a choice between believing in possibility or believing in hopelessness what would you choose? I am a recent convert to the thought of goal setting – be it in investing or all other aspects of life. In life, like in football, what’s the point of aimlessly running around and passing the buck when there is no goal past in sight? In this success principle, Jack Canfield tells us how goal needs to be outrageously big, specific and timely (to the hour). Some of his other tips are quite interesting like reread the goal three times a day (I have not managed to reach that level yet), create a goals book (I am in the process of making a slide show of my goals), carry your most important goal in your wallet (I do) and one goal is not enough (I made a list of 100 goals). Make your goals today, track them and become obsessed. You are bound to achieve them. The biggest problem with outrageous goals? They look extremely intimidating up front. However, the way we cut up a large steak into bite sized chunks, goals are also better managed when you break them into chunks and successively look towards achieving those chunks. In this success principle, one of the tools shared by Jack Canfield is the idea of mind mapping which neatly details out all that might be required to achieve a goal and is a great visual tool for goal setting. What is stopping you from creating your dream life? For a lot of us, fear pushes us into inaction. It’s easier to never have tried than to have tried and failed. How many of us think of starting our own business but then stay with our jobs for fear of never making it? As Jack Canfield writes in this success principle, fear is a physiological bodily reaction that we experience because of our evolutionary history. Fear was a reaction of getting out of our comfort zone and in actual life-threatening circumstances. However, while such circumstances have reduced, our fear still has the potential to paralyse us when we step out of our comfort zone. When I had crushes in school, I would be literally frozen in fear of rejection. We face that same fear when we mumble our answers in job interviews or even visa interviews. The fear of rejections holds us back from being ourselves. As Jack Canfield puts it in this success principle, reject rejection. If someone does actually reject you, you can either take it to heart or choose to reject the fact of the rejection. Canfield urges you to do the latter. One of the most fun social experiment was done by Jia Jiang who decided to ask for the most outrageous things from total strangers for 100 consecutive days to get over his fear of rejection, be it borrowing $100 or asking to deliver a Dominos’ Pizza. Another favourite success principle, this is also something my dad often told me using the example of the Arthur Hailey book – The Final Diagnosis. As Jack Canfield points out, today the pace of change is so swift, that unless we have one ear to the ground and commit to constantly be improving, there is every chance that we will be left far behind. He urges us to decide the area of life where we want to improve and also realise that improvement will not happen instantly or overnight but is a long drawn process. There are two kinds of people – one, people who are successful positive, optimistic and uplifting who have it in them to raise your spirits even after the most defeating day and the other kind who can dull your energies and make small of even the biggest thing you might have done, irrespective of the lack of their own achievements. One of the most popular quotes on this subject is that by Jim Rohn – You are the average of the five people you spend the most time with. In this success principle, Jack Canfield starts with an example of Tim Ferris and how he chooses the people in his life. Then he urges us to be selective, avoid toxic people and surround ourselves with successful people. Ah, time management – my Achilles heel. While a lot of people tell me at work that they admire my time management skills considering I regularly blog, I know I still have a long way to go. What I loved about the way Jack Canfield wrote in this success principle is how successful people are able to find the balance between family and work. How many times we end up hearing that to be successful, you need to ignore family, which is not the case as mentioned by him. He talks about the importance of scheduling and dividing your time into focus days and free days. Focus days obviously involve Deep Work while free days could also mean scheduling for fun. In the personal finance blogosphere, most advice tends towards tamping down on material desires and wanting to spend less. Jack Canfield is all about living a life of abundance, spiritually and materially, till the time it is justified. As he puts forth in this success principle, if you want to spend more money, you need to earn it first. So, if you want to employ more people for your business, earn enough revenue streams to make it viable in the long run, a lesson a lot of businesses forget. 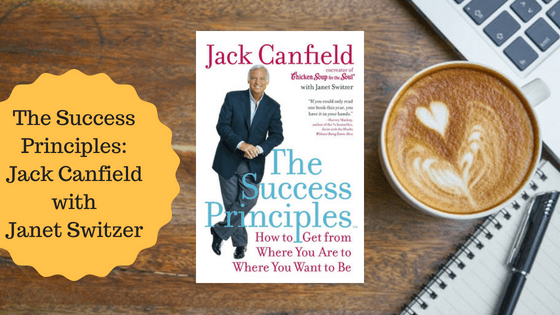 These were 11 of my favourite lessons from Jack Canfield’s The Success Principles. Have you read the book? What were some of the principles you retained and act on in your life? Let me know in the comments below.